Sara Farb gives an absolutely must-see performance in R-E-B-E-C-C-A now playing at Theatre Passe Muraille. The writer-star of the show draws on real-life experiences with her sister to craft an interesting what-if look at what life might have been for the developmentally delayed title character had she been born just two months later. Using a Fight Club-like double character, Farb tells the story of two Rebeccas: the developmentally delayed Rebecca born in May who longs to go to a summer camp and the profoundly depressed Rebecca born in July who is a camp counselor. The story starts on “May’s” 18th birthday when she gets in trouble after asking for a second piece of cake and ends on “July’s” 18th birthday when she feels like her world is going to end. Although she gets the space to do some of the play’s more interesting musing, the camp counselor character “July” is a bit of an outdated stereotype. She condescends to her pretty blonde campers, self-harms and sleeps with men indiscriminately to feel alive. She idolizes the developmentally delayed because they don’t have to conform to societal standards, but she still calls her shrink “Nosehair.” As a writer, Farb expects the audience to read “July” as a deep, intellectual character because she insults the “popular girls” and that’s a character that just doesn’t work for me. 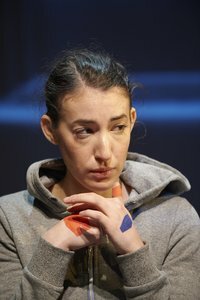 While I feel like “July” is too much of a cookie cutter ’emo’ teenage girl character, Farb’s “May” is one of the most fascinating and watchable characters I’ve ever seen on stage. Farb embodies her developmentally delayed character incredibly convincingly and gives “May” depth and heart on her own terms, something so rarely seen on stage or in film. “May” tells us anecdotes about her life that allow her to be funny and to be adventurous and to express her unexpressed sexuality. Seeing this expertly executed character study was worth venturing out into the biting cold to get to the theatre. Like Fight Club, the story is a little bit overambitious, but it is well put-together. Elizabeth Nutting and Robin Fisher have built a beautiful and simple set out of white sheets and raised platforms that doubles as a canvas for Cameron Davis and Kaitlin Hickey’s gorgeous projections and Rebecca Picherack’s subtle moody lighting design. Composer Reza Jacobs’ music cues are haunting and appropriate. They sound like electronic Gregorian chants, making them both modern and timeless, and they use short, repetitive sounds to build a vocabulary that sets the tone for a story told from the perspective of a developmentally delayed character. They are so impressive that another audience member asked me to see my playbill so that he could find out Jacobs’ name. R-E-B-E-C-C-A might still need a little work to make its story anything more than adequate, but the telling of that story makes it unmissable. Make a trip out into the cold to catch this show before it’s gone! Photo of Sara Farb by Michael Cooper.